SoftPlanet makes it possible for everyone to get free Super Sleep download directly from our servers. There is no registration needed for downloading. Super Sleep 1.0 is a free-to-download application that can put your monitor to sleep in a power saving mode and then you will be able to wake it up with a special hot key combination. Users can change the default shortcut keys which are Ctrl+F9 and Ctrl+F10. It is important to mention that you have to right click on the program setup file and select the option “Run as administrator” for problem-free installation. 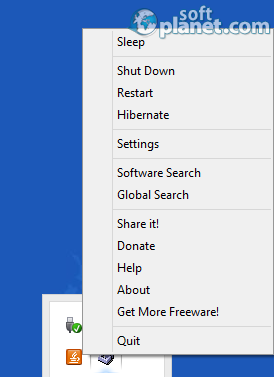 Alongside with the main program function, you can use it to shut down, restart or hibernate your computer. When you put your computer in one of these three stages, then you can turn it back on by pressing any key. Super Sleep can be used as protection against unauthorized access as well. If you set a strong combination key you can prevent the access to your PC when you are away. Our security scan shows that Super Sleep is clean from viruses. The current version of Super Sleep has been scanned by our system, which contains 46 different anti-virus algorithms. That ensures that Super Sleep 1.0 is 100% safe for your computer.